Lugang Cafe is Offering Unlimited Xiao Long Bao For a Whole Month! 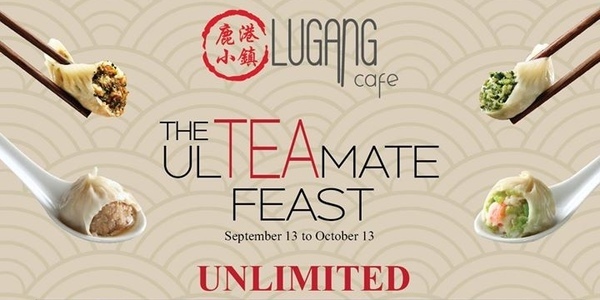 If you simply just can't get enough of xiao long bao, Lugang Cafe's ULTeaMATE Tea Fest is something that would excite the hungry soul in you! The promo runs from September 13 to October 13 (Yep, that's a whole month! ), Mondays to Fridays, from 2:30pm to 5:30pm. For only P298, you get to enjoy your unlimited fill of Lugang Cafe's steamed pork xiao long bao and more - that includes their Steamed Angled Loofah and Shrimp Xiao Long Bao, Steamed Vegetable and Pork Dumplings, Steamed Vegetarian Dumplings with Truffle Oil, Pork Wontons in Spicy Chili Oil, and Taiwanese Rice Noodles with Stewed Mince Pork. Note that the promo is valid for Dine-In only and are not to be availed in conjunction with other promos and discounts. All the members dining in the table also need to avail of the promo, and leftovers aren't allowed unless they're willing to pay the full price. The promo is available in all Lugang Cafe branches. For more information, you may visit Lugang Cafe's Facebook and Instagram pages.